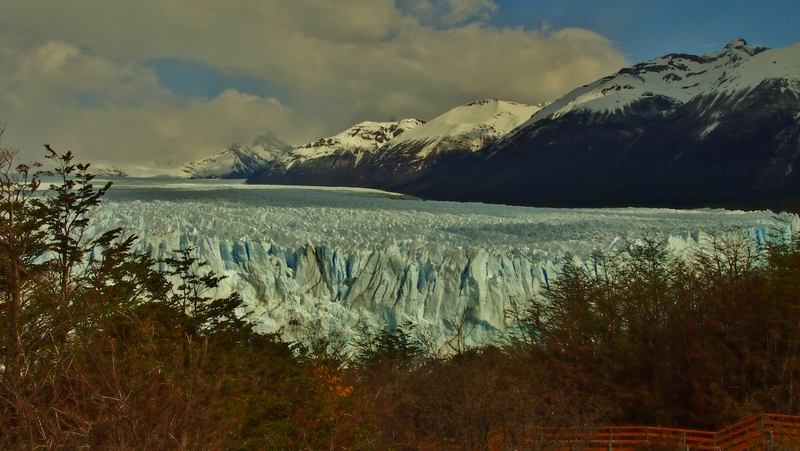 The Perito Moreno Glacier is located in the Los Glaciares National Park in Patagonia, Argentina. The access point is the busy and sprawling El Calafate, this place is certainly not off the beaten track and the town has seen enormous growth over the last few years. New hotel complexes and villas spread from the town for miles. It seems ridiculously unsustainable when the only real attraction is the glacier and boat trips to a few more glaciers. The number of tour operators offering trips to the glacier is vast they all follow a similar itinerary: a bus from town and then a boat to the edge of the ice; there are only a couple of companies operating boats so whatever tour you take the boat section will be the same. There are a couple of longer boat tours that looked good but were hugely expensive these took in a few other smaller glaciers exiting into the lake. Other options for the lazy adventurer was 4×4 tours across scenic landscapes that the 4×4 tracks had surely lessened! Just get out and walk to cool places people! El Calafate in general with its fancy hotels seems to attract an older crowd who like sitting on coaches and being taken places to take pictures. This approach appeals to the older Argentinians and also quite a few Americans it seemed. If you don’t have an expensive top of the range SLR camera that you still click away using the auto settings with, then you wont fit in here! 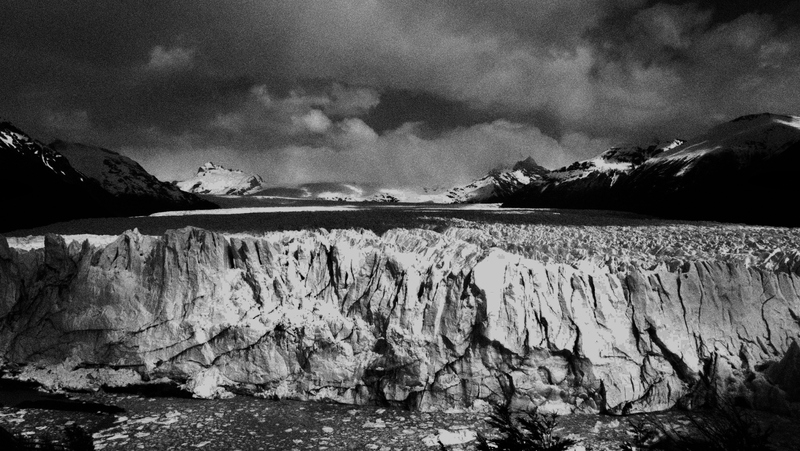 The glacier fortunately is worth enduring the crowds for. It is majestic and indeed the whole area is stunning but the encompassing lake makes so much inaccessible to explore. 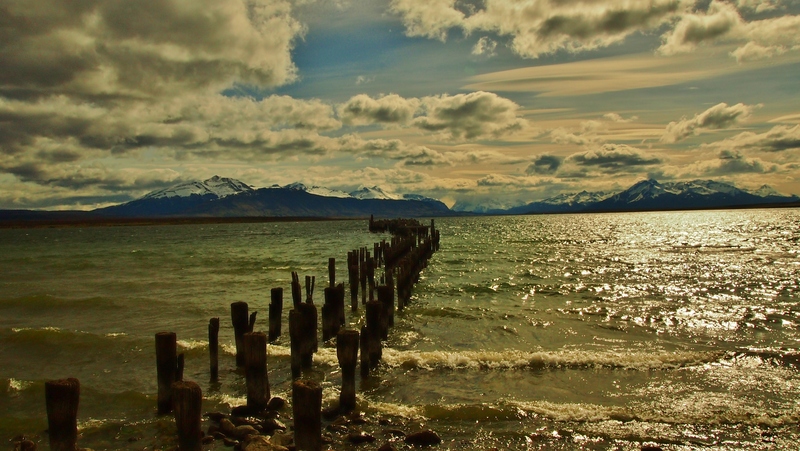 The view below was looking up the lake towards Perito Moreno, it is one of my favourite pictures from the whole summer. 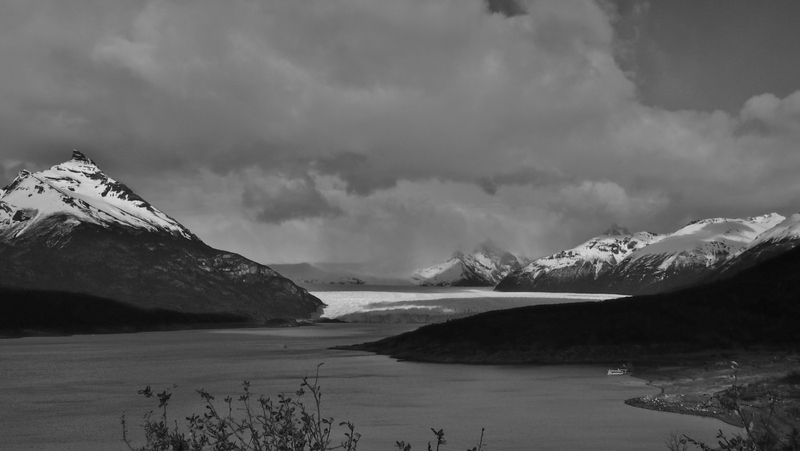 The picture below is the first viewpoint as we approached the main glacier. Its vastness can be measured by a speck on left in the lake that is a decent-sized tour boat. The ice cliffs that spread into the lake tower about 75m above the water level! 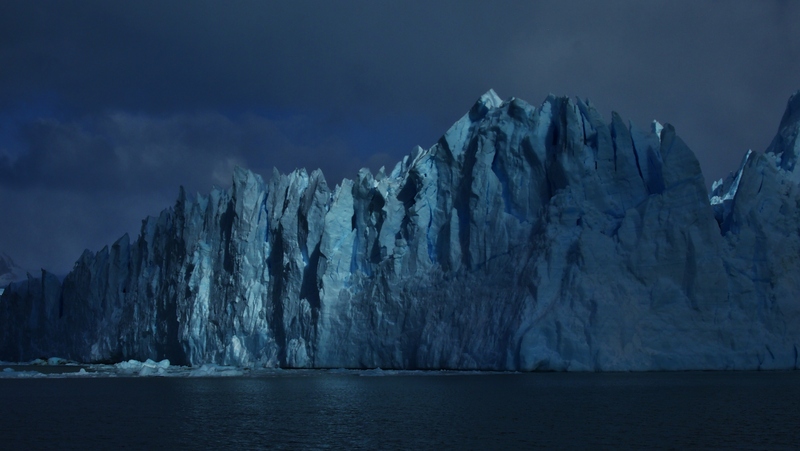 Interestingly the glacier is one of the only advancing glaciers left in the entire world. It is certainly the only glacier I have seen that has not hugely retreated over the last few years. The Southern Icefield is retreating at other points but here the huge snowfall that feeds the ice flow has continued unabated by climate change. Nobody knows exactly why but one theory is that (slightly ironically) global warming has increased the precipitation levels that has fed this advance. We took the boat on the lake and we got to about 300m of the ice cliffs, dodging huge floating icebergs as we went. When looking down on the ice bergs floating in the lake it is clear to see the vast amount of ice the extends under the water – the section you see really is just the tip of an iceberg! The swiftly passing clouds on the day we visited created some stunning light effects on the ice as patches of cloud were interspersed with shafts of sunlight (the picture below shows this). The main viewing area of the glacier was equipped with loads of wooden walkways that extended all the way to the lakeshore. The picture below highlights the odd shape of the ice, it has the appearance of being made up of many shards stuck together with spiky tops. Walking across the glacier would be impossible, there are just no flat sections. With the rapid advancement of the ice it crosses the lake to create a dam. This leads to one side of the lake which is fed by a river filling up to create a reservoir. Eventually this water pressure is too much and the ice breaks up allowing the water to burst through. This happens fairly infrequently; the last rupture occurred on January 19th 2013, and previously on average, about every four to five years (March 2012, 2008, 2006, 2004, 1988, 1986, 1980, 1977, 1975, 1972, 1970, 1966, 1963, 1960, 1956, 1953, 1952, 1947, 1940, 1934 and 1917). In 2013 it left a huge arch that slowly collapsed, when we visited the ice was just about to cross the entire lake again and start the next damming phase! We spent hours watching the ice waiting for huge chunks to fall off. We saw some good crashes into the lake, with the enormous roar as it fell. Ice falling is always louder than you would expect. I am lucky enough to work in front of a glacier in France during the winter, which is always crashing and sliding loudly. We played around on the camera with some fun effects like the grainy black and white shot below that I think captures the drama of the scene. I also took some cool time lapse footage that is in my Snowboarding Patagonia movie also on this blog. After the tour we returned to El Calafate, which did have a great bakery – a saving grace. The following day we made a sharp exit in pursuit of new adventures around El Chalten which was the final stop of our summer or winter depending on how you see it!